The researcher at the CONICET was awarded for his contributions to the production of new knowledge, training of human resources and technology transfer. Photo: courtesy Ministry of Science, Technology and Productive Innovation. 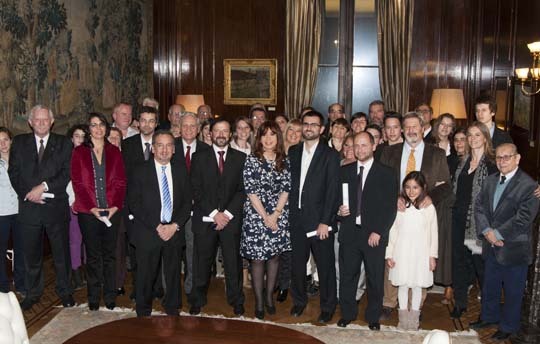 In a ceremony held at the Salón de las Mujeres del Bicentenario [Women of the Bicentennial Hall] of the Casa Rosada presidential palace, CONICET scientist Gustavo Politis was awarded the “Investigador de la Nación Argentina” [National Researcher] prize by President Cristina Fernández de Kirchner. Politis is the director of the Instituto de Investigaciones Arqueológicas y Paleontológicas del Cuaternario Pampeano (INCUAPA, CONICET–UNCEN) [Institute of Archaeological and Paleontological Research of the Quaternary Period of the Pampas Region]. As part of the National Popularization of Science and Innovation of the Ministry of Science, Technology and Productive Innovation, this award acknowledges the contributions of the researchers for the production of new knowledge, social and productive impact of the technological innovations and training of human resources. The awardee has a PhD in Natural Sciences and a degree in Anthropology of the Universidad Nacional de La Plata (UNLP) [National University of La Plata], where he teaches at the Faculty of Natural Sciences and Museum. He had also received the Houssay Award for Career by the Ministry of Science due to his contributions to Human Sciences in the production of knowledge on original peoples of South America. As regards the prize, Politis said: “It is the product of individual work but it is mainly team work. Although it sounds like a common assertion, I really feel it like that. This is the result of a great commitment of the country to promote the growth of the CONICET, public universities and research development”. At the same event, the Ministry of Science gave the Houssay Awards, which were aimed at researchers under 45 years old; Houssay for Career, for over 45; and Jorge Sabato, which acknowledges those scientists who stood out in transferences and technological development. – Biological, Agrarian, and Veterinary Sciences: Adrián Luis Lifschitz, CONICET independent researcher at the Centro de Investigación Veterinaria de Tandil (CIVETAN) [Veterinary Research Centre of Tandil] for his contributions to the development of veterinary antiparasitics. – Earth, Water and Atmospheric Sciences, and Astronomy: Diego Pol, independent researcher of the Council at the Museo Paleontológico Egidio Feruglio [Egidio Feruglio Museum of Paleontology] for his contributions to the paleontological description of Patagonia. – Human Sciences: Silvia Alejandra Manzo, CONICET independent researcher at the Instituto de Investigaciones en Humanidades y Ciencias Sociales (IDIHCS, CONICET-UNLP) [Institute for Research in the Humanities and Social Sciences], for her research on Francis Bacon. – Engineering, Architecture and Technology: Diego Humberto Milone, CONICET independent researcher at the Universidad Nacional del Litoral [National University of Litoral]. He was awarded for his studies and contributions to the productive sector, especially in health. – Biological, Agrarian and Veterinary Sciences: Sandra Myrna Díaz, CONICET senior researcher at the Instituto Multidisciplinario de Biología Vegetal (IMBIV, CONICET-UNC) [Multidisciplinary Institute of Plant Biology], for his contributions to the theoretical development and practical implementation of the concept of functional diversity, its effects on the ecosystem properties and its social relevance. – Earth, Water and Atmospheric Sciences, and Astronomy: Carlos Washington Rapela, senior (R) researcher of the Council at the Centro de Investigaciones Geológicas (CIG, CONICET-UNLP) [Geological Research Centre] and former director of the Centro Científico Tecnológico La Plata [Scientific and Technological Centre of La Plata], for his geochemical studies on igneous rocks and his contributions to the knowledge on South American geological evolution. – Human Sciences: Gustavo Gabriel Politis, senior researcher of the Council. is the director of the Instituto de Investigaciones Arqueológicas y Paleontológicas del Cuaternario Pampeano (INCUAPA, CONICET–UNCEN) [Institute of Archaeological and Paleontological Research of the Quaternary Period of the Pampas Region]. He was awarded for his contributions to the production of knowledge on original peoples of South America. – Engineering, Architecture and Technology: Eduardo Natalio Dvorkin. He was awarded for his developments on Computational Mechanics and his contributions for the private and the public sectors. This time, the “Jorge Sabato Award” was for Carlos Alberto Querini, CONICET senior researcher at the Instituto de Investigaciones en Catálisis y Petroquímica “Ing. José Miguel Parera” (INCAPE, CONICET-UNL) [“Ing. José Miguel Parera” Research Institute of Catalysis and Petrochemistry]. He received the prize for his contributions to research into biodiesel technology.